Back in January I participated in a panel on Math Games over at the Global Math. I meant to write this follow-up post shortly after, but January was a hell of a month for me and it slipped to the wayside. See my talk here, at the 2:55 mark. 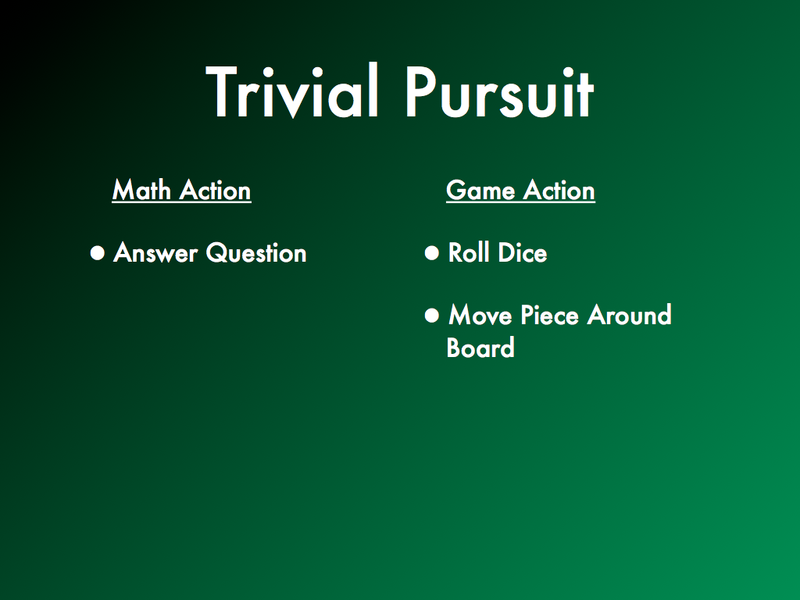 I sorta hit the same point over and over, using six different games as examples, but that’s because I truly believe it is the most important point in both designing math games as well as choosing which games to use in your classroom. If the math action required is separate from the game action performed, then it will seem forced and lead students to believe that math is useless. This can be fine if you want. Maybe you want to play a trivia game, where the knowledge action is separate from the game action. But if you pretend that they are the same, then you have problems. Below are the six examples I gave, with the breakdown of their game action and math action. I hope to use what I learned in this process to have us make a new, better math game in the summer, during Twitter Math Camp. 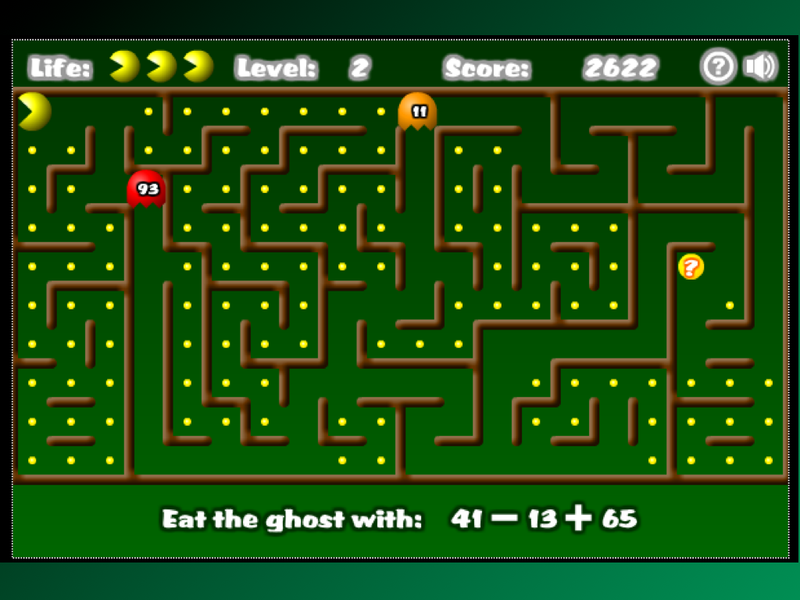 A Pac-Man game where you can only eat a certain ghost, depending on the solution to an equation. If we apply the metric above and think about what is the math action and what is the game action? Here, the math actions are simplifying expressions and adding/subtracting, but the game actions are navigating the maze and avoiding ghosts. If I’m a student playing this game, I want to play Pac-Man. The math here is preventing me from playing the game, not aiding me, which makes me resentful towards that math. 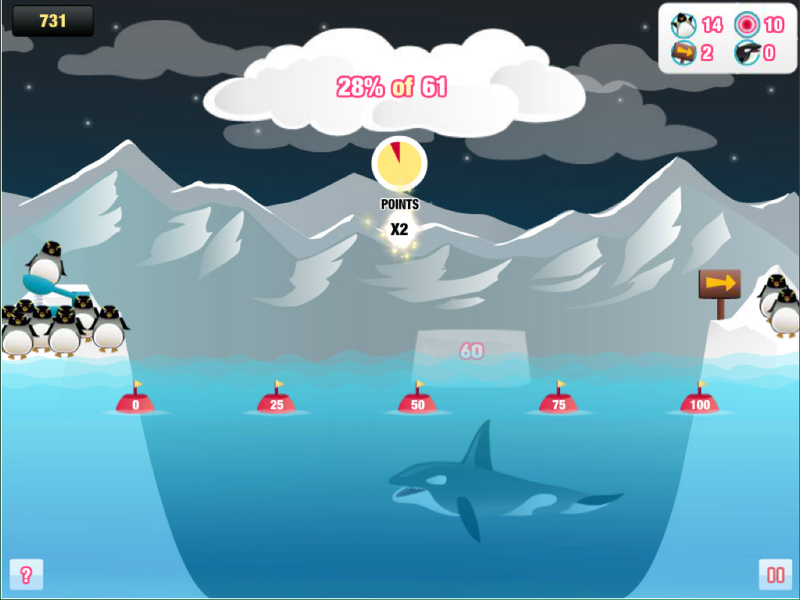 In this game, you help penguins cross a shark filled expanse by placing a platform for them to bounce over. Because of a time limit, you can’t calculate precisely where the platform needs to go, so you need to estimate. That skill is both the math action and the game action, so that alignment means that this game accomplishes its goal. 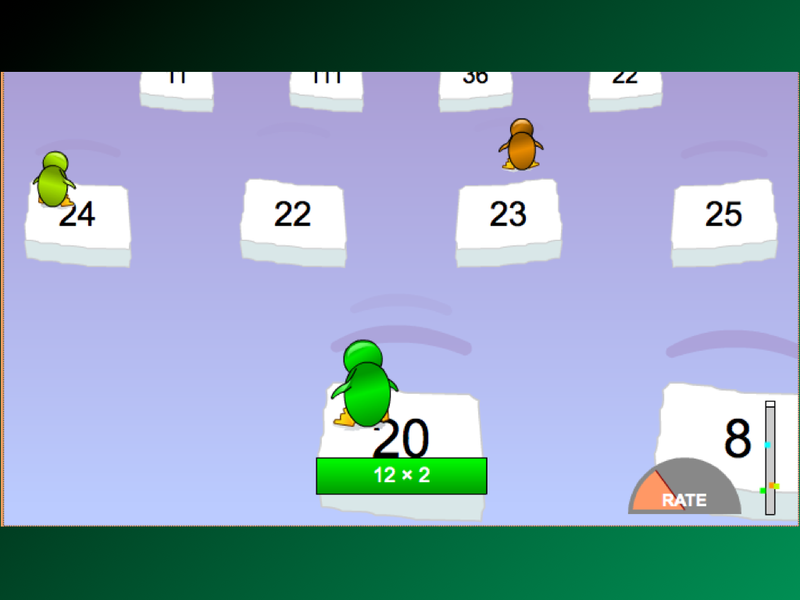 Here you pick a penguin, color them, and then race other people online jumping from iceberg to iceberg. The problem is that the math action is multiplying, which is not at all the same. The game gets worse, though, because AS the multiplying is preventing you from getting to the next iceberg, because maybe you are not good at it yet, you visibly see the other players pulling ahead, solidifying in your mind that you are bad at math, at exactly the point when you need the most support. A good math game should be easing you into the learning, not penalizing you when you are at your most vulnerable point, the beginning of your learning. This is a game that seems like it has potential: given a number, factor that number into a rectangle (shout-out to Fawn Nguyen here in my talk), then drop the block you created by factoring to play Tetris. I’ve written about Dragonbox before, so I won’t write about it too much here. 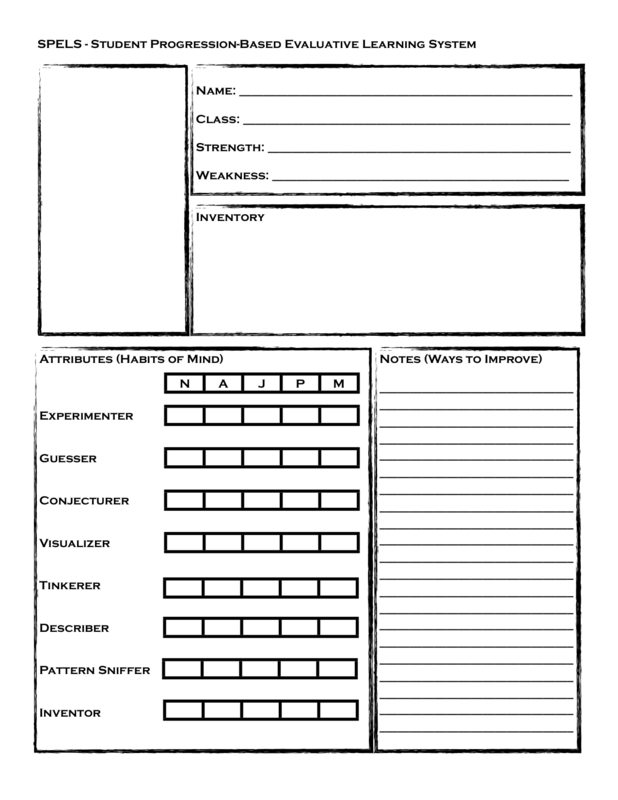 The goal of Dragonbox is to isolate the Dragon Box by removing extraneous monsters and cards. 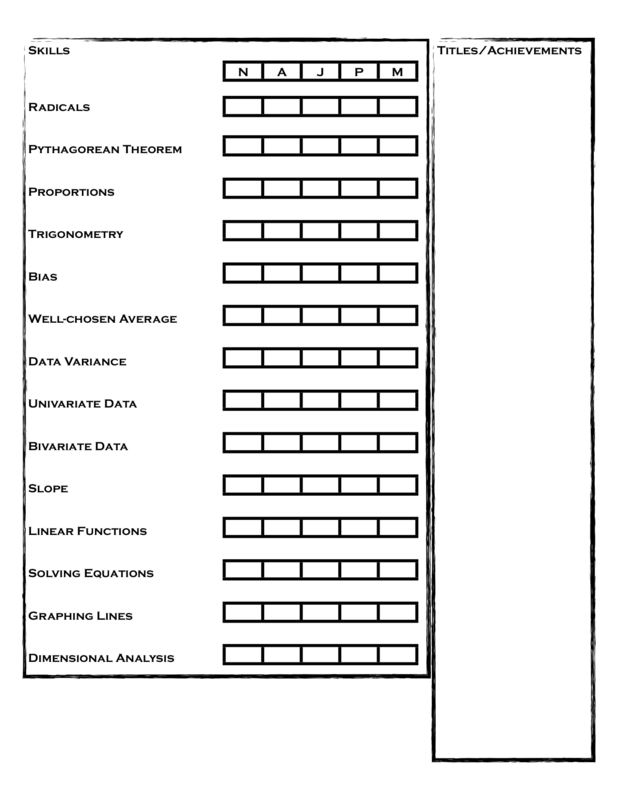 The math actions include combining inverses to zero-out or one-out, or to isolate variables. The game action is to combine day/night cards to swirl them out, or isolate the dragon box. 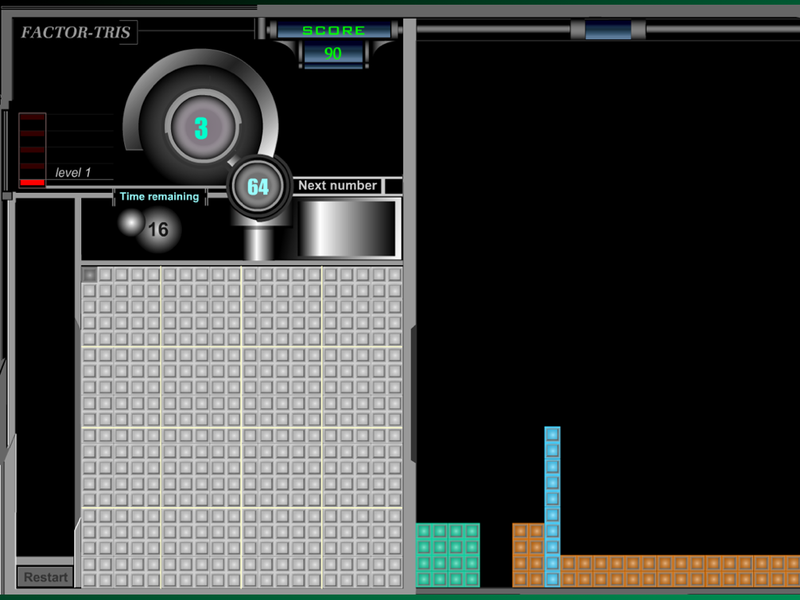 The game action is in perfect alignment with the math action, which makes the game very engaging and very instructive. The board game I created last year (and you can also make your own free following instructions here, or buy at the above link). 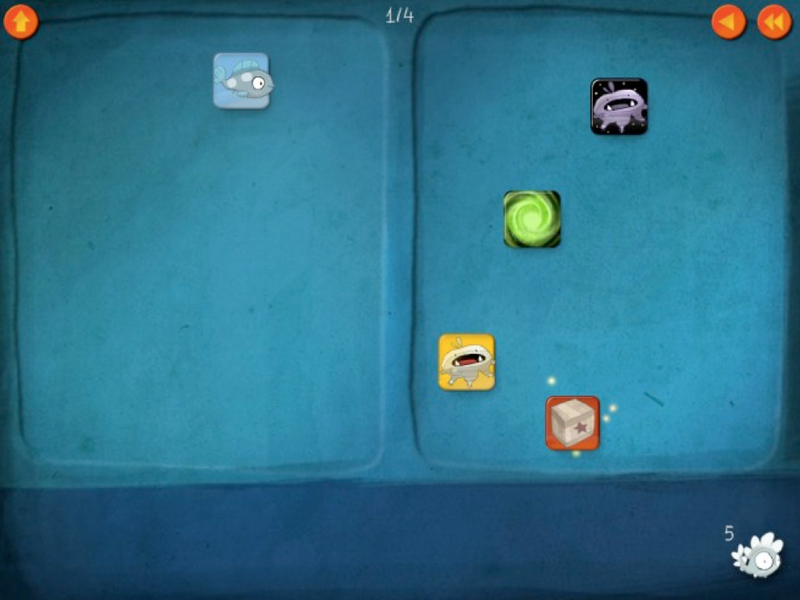 In this game, the game actions were designed to match up with math actions. Simplifying a radical by moving a root outside the radical sign, as in the picture above, is done by playing the root card outside and removing the square from the inside (and keeping it as points). 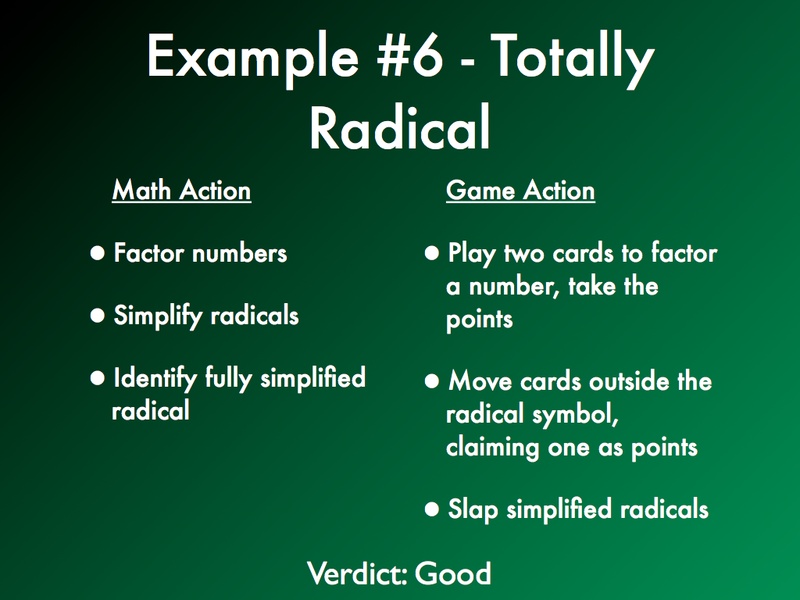 You also need to identify when a radical is fully simplified, which you do in game actions by slapping the board (because everything is better with slapping) and keeping the cards there as points. One of the real challenges of finding good math games, as a teacher, is curriculum. Most math teachers know of several good math games, like Set or Blokus. While these games are great and very mathematical, they’re not the math content that we usually need to teach in our classes. So the challenge falls on us to create our own games, but making good math games is hard. (Making bad ones is pretty easy.) On that note, if you know of some good math games (that meet the criteria mentioned in this post), drop a line in the comments! Have you ever been to a carnival or amusement park and seen one of those people who will try to guess your weight, height, or age? If they get within a certain range of your weight, they win and keep your money. If they are wrong, you win and get a prize. I’ve occasionally wondered how they determine what their range is. This clip from Steve Martin’s The Jerk makes me wonder, instead, how they determine which prizes they can give away. That’s the lead-in I give the students. Steve Martin can only give away that small section of prizes because he is a terrible guesser, so he often loses. If you worked for the carnival as a guesser, what can you give away? I have the students go around and guess the weight and height of any 10 willing participants in the class. (Any student can turn down being guessed, so students had to ask first. Also, I think my students were always worried about insulting someone, because they almost always under guessed. Also, many of your students may not know how much they weigh, so doing this lesson near when they have a fitness test and get weighed in gym is a good idea.) They record their guess, the actual amount, and the difference between the two. Then, in groups, they try to determine a metric for figuring out who is the best guesser. We talk about how being 10 pounds off for a super thin person, child, or baby is much worse than being 10 pounds off for a very large person. We also talk about how being over or under doesn’t really change how good the guess is. After I push back on their metrics, some students pick up on the proportionality of the guess to the real amount, and lead us into relative error. I somewhat drop the conceit at that point, mostly because I’m not sure of the best way to finish it off. But I like the start, and it’s a very natural intro to relative error, and the relative size of numbers in general.